“On-hold music” is an entire industry in itself, plus there are numerous opinions, studies, and articles that focus solely on the type of music you should play for customers when you put them on hold. NPR’s segment “What Makes You Happy When Your Call Is Put on Hold?” explored the evolution of the industry and how hold music can impact customer satisfaction. While on-hold music technically does very little to increase a caller’s level of satisfaction, being greeted by silence has a negative impact on customer service according to Scott Broetzman, President of Customer Care and Consulting. Customers were more positive when they received on-hold greetings with estimates of how long they’d be waiting. Emily Yellin, the author of “Your Call is Not that Important to Us,” added that treating customers well and keeping hold times shorter than a minute were the real keys to increasing satisfaction. Answering the phone in less than a minute might not be a realistic goal for your company at this moment, thus making your on-hold music choices very important. Having a system in place, such as an auto attendant, for handling the extra call volume may be necessary. But, remember your company’s first impression is made through your greetings and on-hold messages or music. Projecting a polished image for your company. Making hold time seem shorter. Matching your current advertising and branding campaigns with your music selection can project a unified company. 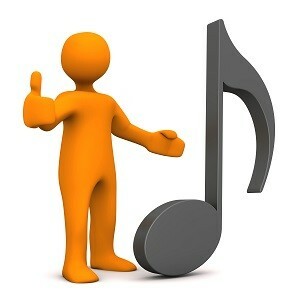 As customers call, appropriate music selection decreases frustration, thereby reducing the number of dropped calls. This will lead to higher first call resolution rates and increased customer satisfaction. Well-chosen on hold music will make your customer’s time on hold seem shorter. There’s definitely more to the on-hold music than simply uploading a song from your iTunes account (potentially illegal, by the way). Taking the time to seek the right music selection for your organization will be worth the effort as your customers have more favorable impressions of your company as well as their customer service experience. This entry was posted in Halloo, Music on Hold, Small Business by Jim Li. Bookmark the permalink.